Pope Francis is coming to town and that means traffic troubles and potential headaches for motorists not just in Philadelphia but in South Jersey, Delaware and the suburbs. 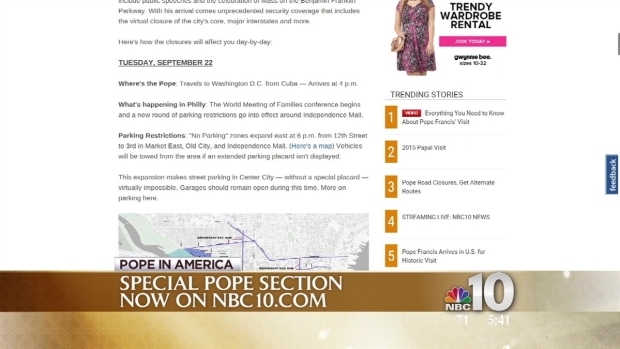 NBC10's Vince Lattanzio has the latest on how to find all the Pope information you need to know for the upcoming Papal weekend. CLOSED Thursday night to (sometime) Monday morning: Vine Street Expressway (I-676) exits to 23rd Street/Ben Franklin Parkway, Broad Street and 8th Street will be closed. Security closures are taking shape in Center City, meaning that Philadelphia residents should be aware of having everything they need in anticipation of road and store closures as Pope Francis visits this weekend. 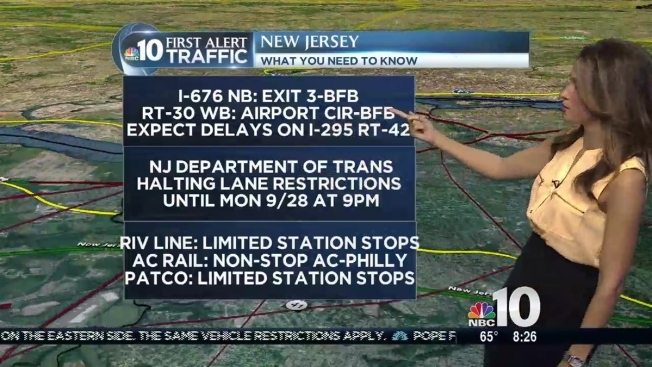 ALTERNATE ROUTES: At this point, I-95 and I-76 will remain open so plan on using exits from those roads or sticking to surface streets instead. The ramp from City Avenue (Route 1) to the Roosevelt Expressway will also remain open. CLOSED 10 p.m. Friday to (sometime) Monday morning: The Schuylkill Expressway (I-76) eastbound from the Blue Route (I-476) to I-95 and westbound from I-95 to U.S. Route 1. ALTERNATE ROUTES: With the access points to the city along both Kelly and Martin Luther King drives also closed, roads such as Ridge Pike, Cobbs Creek Parkway, Route 23, Henry Avenue and other surface roads can be used to get in and out of the city but expect serious delays and other possible traffic closures once you approach the traffic box. CLOSED 10 p.m. Friday to (sometime) Monday morning: Vine Street Expressway (I-676) in both directions between I-76 and I-95 in Pennsylvania. 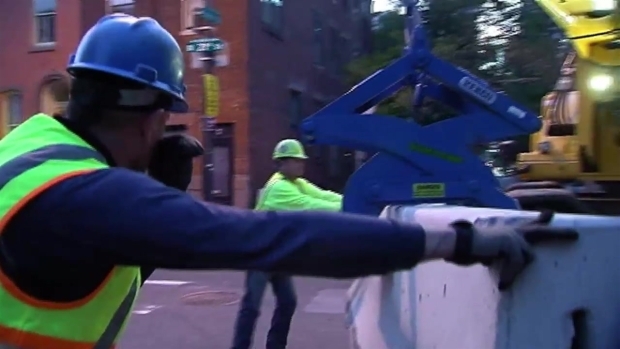 Crews were hard at work Friday morning putting the final touches on the barricades that will control crowds during Pope Francis' visit to Philadelphia. ALTERNATE ROUTES: If you are within the traffic box, roads like Pine and Spruce streets could be used to get across town. I-95 could be your best bet however since it’s a highway and will allow cars to pass throughout the visit. ALTERNATIVE ROUTES: The areas served by these exits (with the exception of Broad Street) are in the restricted driving area during the Pope visit so unless you can leave your car inside that area, don’t plan on getting into it. CLOSED 10 p.m. Friday to noon Monday: Cars won’t be allowed on the Ben Franklin Bridge. Pedestrians will be able to walk across the span from Camden to Philadelphia. ALTERNATE ROUTES: The Betsy Ross and Walt Whitman bridges will remain open to vehicles. CLOSED 12:01 a.m. Saturday to 7 a.m. Monday: Areas near SEPTA’s 69th Street Terminal in Upper Darby. ALTERNATE ROUTES: Upper Darby Township set up drop-off and pick-up areas along Market and Garrett roads as well as West Chester Pike. CLOSED Friday to Monday: Area around Wilmington Amtrak Station -- Rosa Parks Drive, S French Street and Water Street (partial). ALTERNATE ROUTES: DelDOT plans to keep ramps from I-95 and other roads open. Best bet is to avoid the train station area unless you plan on taking the train. CLOSED 10 p.m. Friday to noon Monday: Admiral Wilson Boulevard (U.S. Route 30) from U.S. Route 130 (Airport Circle) to the Ben Franklin Bridge and I-676 from Morgan Street to the bridge. ALTERNATE ROUTES: Route 42 to the Walt Whitman Bridge can be used instead. Motorists are being allowed to park in Camden at a cost so expect surface streets in the city to remain open with police directing traffic like they would during a concert at the waterfront. Don’t expect getting into Center City or University City during the papal visit. Here is the full list and map (care of the city) of which roads will be closed. CLOSED 8 a.m. Friday to (sometime) Monday: All Authorized Vehicle Routes in Philadelphia. The Secure Vehicle Perimeter around areas (Ben Franklin Parkway and Independence Hall) where Pope Francis will appear goes into effect starting Thursday night. Click here for details. CLOSED 10 a.m. Saturday to 10 p.m. Sunday and then CLOSED 7 a.m. to 4 p.m. Sunday: City Avenue (U.S. Route 1) northbound from Lancaster Avenue (U.S. Route 30) to I-76 and City Avenue southbound from Belmont to Lancaster with "unannounced periodic closures for security reasons" that could spread to I-76, said City Ave District. ALTERNATE ROUTES: In the city, Woodbine and Overbrook avenues run parallel to City Ave. On the suburban side, Bowman and Montgomery avenues as well as Remington Road could be used to get where you’re going. Cross traffic will remain flowing on major intersections like Presidential Boulevard, Belmont, Unshaken state Road (Route 23), Bryn Mawr Avenue, Old Lancaster/54th Street and Lancaster Avenue.